Abner leaves King David to garner support from the northern tribes. Abner ("Father of [or is] light"), was the first cousin of the Israelite King Saul and commander-in-chief of his army (1 Samuel 14:50, 20:25) in the late eleventh century C.E. After Sauls' death, Abner supported the king's heir, Ish-bosheth, as king of Israel at Mahanaim, east of the Jordan. King David, who at this time was accepted by Judah alone, was meanwhile reigning at Hebron. For several years during a civil war between Judah and the northern tribes, Abner's support allowed Ish-bosheth to reign over a greater territory and population than David. A dispute over Abner's designs on one of Saul's concubines led to a falling out between Abner and Ish-bosheth. Abner then went over the David's side, delivering David's former wife Michal in the bargain. Abner also promised David to rally additional northern support to his cause, but was soon slain by David's own commander, Joab. David publicly disassociated himself from Joab's deed but did not otherwise punish him. Abner was given an honorable funeral at Hebron, where his traditional grave still stands. Ish-bosheth, meanwhile, did not survive long after Abner's death, being assassinated by two of his own men, thus leaving David the sole claimant to the throne of Israel. 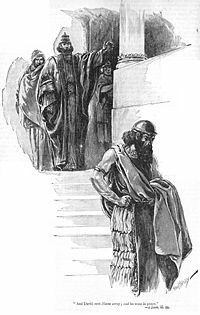 Abner first enters the biblical narrative in 1 Samuel 14, where he is introduced as "the commander of Saul's army" and the son of Saul's uncle Ner. However, 1 Chron. 8:29-33, implies that Abner himself was Saul's uncle, with Ner being Saul's grandfather. In any case, the name Abner means literally "(my) father (is) Ner," but can also be translated "(my) father (is) light," or even "father (of) light." Before Abner is introduced in the text, Saul and his son Jonathan have already engaged in several important battles against the Philistines, but it may be assumed that Abner was involved in at least some of these. The text also mentions that "whenever Saul saw a mighty or brave man, he took him into his service." (1 Samuel 14:52) It may be inferred that one of Abner's roles as military commander was to conscript soldiers on Saul's behalf. By the next time Abner appears on the scene, Saul has already been rejected by God, as a result of his failure to annihilate the Amalekites. Once again, Abner's role in this key battle is not specified. In 1 Samuel 17, it is to Abner that Saul turns to discover the identity of the young David, who has just slain Goliath. Abner confesses that he has no idea about the young man's parentage and is sent by Saul to find out. He returns with David in tow, the latter still holding the giant's head. David soon emerges as the greatest of Saul's warriors. His exploits are told in detail, while Abner is portrayed sitting passively next to the king (1 Kings 20:25) or sleeping by his side in camp (1 Samuel 26:5), rather than actively engaged in combat. The portrayal, of course, is written by sources loyal to David rather than Saul, so it is likely that Abner's role was something greater than what has come down to us in the text. In the intervening years, David flees from Saul and joins forces with the Philistines, the mortal enemies of Israel and Saul. However, in all of Saul's many military exploits—even the crucial Battle of Mount Gilboa, in which Saul and Jonathan lose their lives—Abner is hardly mentioned, although his role must have been great. Abner's forces battle those of Joab after the incident at Gibeon. After Saul's death at Gilboa the biblical writers give Abner greater credit. It is he who rallies the Israelites to the cause of Saul's surviving son Ish-bosheth. David, meanwhile, leaves the Philistines and reigns at Hebron over the single tribe of Judah. Abner brings Ish-bosheth to the town of Mahanaim, east of the Jordan, where Ish-bosheth rules over "Gilead, Ashuri and Jezreel, and also over Ephraim, Benjamin, and all Israel"—a territory much larger and more populated than David's kingdom of Judah (2 Sam. 2:9). In a moment of apparent peace between the two camps, Abner meets David's general, Joab, at the pool of Gibeon. Abner proposes that their young warriors engage in hand-to-hand combat, 12 against 12. The fighting turns serious, with Joab's men gaining the upper hand. Joab's fleet-footed brother Asahel chases Abner, who does not want to engage him, for fear of creating bad blood with Joab and David. When Asahel refuses to give up the chase, Abner finally turns and slays him with a spear thrust. 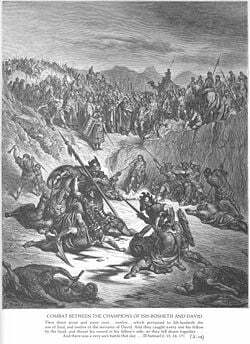 Joab's forces then pursue Abner to take vengeance, and the tribe of Benjamin rallies to Abner's defense. After fierce fighting, Abner offers a truce: "Must the sword devour forever?" he says. "Don't you realize that this will end in bitterness? How long before you order your men to stop pursuing their brothers?" (2 Samuel 2:26) Joab accepts, and the two sides withdraw to their respective capitals. The real turning point in the struggle, however, comes when Abner has a falling out with Ish-bosheth and goes over to David's side. The controversy arises over an affair between Abner and the concubine of Ish-bosheth's father, Saul. "Now Saul had had a concubine named Rizpah daughter of Aiah," the text relates. "And Ish-bosheth said to Abner, 'Why did you sleep with my father's concubine?' Abner was very angry because of what Ish-bosheth said and he answered, 'Am I a dog's head—on Judah's side? This very day I am loyal to the house of your father Saul and to his family and friends. I haven't handed you over to David. Yet now you accuse me of an offense involving this woman!'" With the weak Ish-bosheth incapable of opposing him, Abner sends to David, saying "Make an agreement with me, and I will help you bring all Israel over to you." As proof of Abner's good faith, David demands that he come to Hebron and bring with him Michal, the daughter of Saul, who had been David's first love and wife. Despite the fact that Michal was now married to another man, the fearful Ish-bosheth foolishly allows both Michal and Abner to leave. Michal's poor husband, Paltiel son of Laish, follows the procession, weeping piteously until Abner orders him to return home. Abner confers with other northern tribal leaders and arrives at Hebron, bringing not only Michal, but also 20 soldiers and a pledge of loyalty from the entire tribe of Benjamin. He also pledges to deliver the support of elements of other northern tribes, who have lost faith in Ish-bosheth's leadership. David dispatches Abner north to muster this support for his kingship. Joab, meanwhile, has learned learned of Abner's visit. He immediately sends messengers to recall him. When Abner dutifully returns, Joab kills him. Ostensibly he has acted "to avenge the blood of his brother Asahel," but no doubt he also senses in Abner a threat to his own position. David publicly declares himself innocent of the crime. However he does not seriously punish Joab for his act. Should Abner have died as the lawless die? You fell as one falls before wicked men." Soon, Ish-bosheth was assassinated as he slept, and David became king of the northern Israelite tribes, as well as of Judah. Abner is the hero par excellence in the Haggadah (Yalḳ., Jer. 285; Eccl. R. on 9:11; Ḳid. 49b). Conscious of his extraordinary strength, he exclaimed: "If I could only catch hold of the earth, I could shake it." According to the Midrash, it would have been easier to move a wall six yards thick than to move one of the feet of Abner. Yet when his time came, Joab smote him. But even in his dying hour, the mighty Abner seized his foe like a ball of thread, threatening to crush him. The people pleaded with Joab for Abner's life, saying: "If you kill him we shall be orphaned, and our women and all our belongings will become a prey to the Philistines." Abner answered: "What can I do? He has extinguished my light." The Israelites replied: "Entrust your cause to the true judge [God]." Then Abner released his hold upon Joab and fell dead to the ground (Yalḳ. l.c.). One source attributes Abner's mighty powers to the fact that his mother was the Witch of Endor. Nevertheless, the rabbis agree that Abner deserved this violent death, though opinions differ concerning the exact nature of his sin. On the whole, he is considered a "righteous man" (Gen. R. 82:4). Although Abner must have been among the Israelite commanders who refused to comply with Saul's outrageous order to kill the priest at Nob (1 Samuel 22), the rabbis reproach him that he did not use his influence with Saul to prevent him from murdering the priests (Sanh. 20a). Instead of contenting himself with passive resistance to Saul's command (Yalḳ., Sam. 131), Abner ought to have tried to restrain the king. Others maintain that Abner did make such an attempt, but in vain, and that his one sin consisted in that he delayed the beginning of David's reign over Israel by fighting against him after Saul's death (Sanh. l.c.). Others blame Abner for having prevented a reconciliation between Saul and David. Moreover, it was wrong for Abner to permit Israelite youths to kill one another for sport (2 Sam. 2:14-16). No reproach, however, attaches to him for the death of Asahel, since Abner killed him in self-defense (Sanh. 49a). 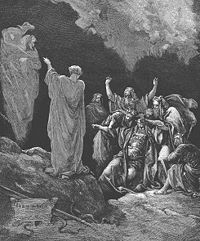 One legend impugns Abner's ancestry, relating that Abner was none other than the son of the Witch of Endor (Pirḳe R. El. 33). Nevertheless, others held his lineage to be a noble one. Indeed, one of the most prominent families in Jerusalem in the middle of the first century of the common era claimed descent from Abner (Gen. R. xcviii.). The story of Abner comes down to us in the context of the struggle between Saul and David, in which the biblical writers see David as standing on God's side, while Saul has been rejected by God. Abner thus become a tragic figure, nobly rallying the tribes of Israel to the cause of the hapless Ish-bosheth, a weak leader who does not deserve the loyalty that Abner gives him. Nevertheless, the spectacle of Abner betraying Ish-bosheth and going over the David's side must give one pause, not only for its moral ambiguity, but also because of Ish-bosheth's inexplicable behavior in the episode. He not only allows Abner to leave after he has explicitly declared that he intends to make David king of Israel, but Ish-bosheth even facilitates Abner's tearing Michal from her loving husband to be returned to David in what can only be seen as a peace offering. The more immediate issue, of course, was that Joab supported David's son Adonijah in his attempt to seize the throne while David still lived. Abner's death may have provided the justification, but it was Joab's threat to Solomon's reign that was certainly the true cause of Joab's death. ↑ Abner Jewish Encyclopedia. Retrieved February 1, 2018. This page was last modified on 25 January 2019, at 16:56.